Yes, we know. It's been a while. But it's all good, and it's only going to get better from here on out. 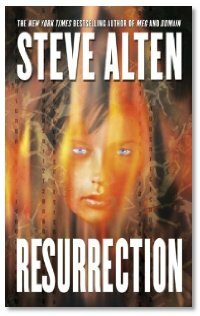 Michael and Summer talk with Steve Alten about Resurrection, the second book in his Domain trilogy. Steve's a busy author with so many monsters to juggle, and he tells us all about the mythology behind the Domain trilogy, and how he has woven a story around the Mayas and the prophecies surrounding their eerily accurate calendar, which ends without explanation on December 21, 2012, and it's implication that humanity, or life as we know it, will end in the near future, makes for an irresistible tapestry to wrap around a mystery. The Library: Mike, Summer and Joe do a quick fly-by of some of the books in the backlog that has become the Studio Library. Never fear, we will get through them soon enough! Holly Lisle posted about how publishers and bookstores work the other day. It goes a long way towards addressing the issue you were discussing about finding book three and deciding to buy books one and two but they aren't on the shelf. It might be something worth discussing on an upcoming show, because I'm not sure the problem is widely understood. hi, this is the author of I Was a Teenage Dumpeal. i wanted to leave you a messege, but i don't have a mic in front of me right now since I'm packing. though i still wanted to leave a few comments sooner than later. I know that Damfir; Vampeal; Dunpeal; Dampeal; a dozen other ways that you can say half-vampire are more universally recognized, But frankly I didn't want to be sued. so after a little searching, I found that another way to refer to a half-vampire was a Dumpeal. and the name stuck. as far as how to pronounce Kyli, think of it like Kyle, but when it comes to the "E", say "e" like you would in the last name Lee. more or less say it like you are saying "Kilee". That's an interesting viewpoint, Jay, and one I've read before. Problem is, it depends on the indie bookstore near you. Changing Hands in Tempe is a lovely store, but if I shopped there for specfic, I'd be caught between a rock and a hard place. Their SF/F section is one shelf, front and back, about 10 feet long and 5 feet tall. That's it. The Poisoned Pen in Scottsdale is marvelous, but their focus is mystery and thriller. I've only seen one shelf of SF/F in there... as in one shelf inside a bookcase of other shelves. So while I can see how writers outside of Stephen King, JK Rowling, and a handful of other major names have problems keeping more than a few titles on the shelves, I don't think the big chains' methodology is the sole contributor to the problem, nor are indies the sole solution to the problem. Oh, as for shelving books, I take into account my distaste at not finding all books in a series together, and when I find books that are mis-shelved, either alphabetically or with series books nowhere near each other, I fix that. I think Holly was addressing the fact that the combination of online shopping and the way that chains order books by default (obviously some chains do things differently, and some indie shops are useless) are leading to the problems you were describing where Book 1 is long out of print by the time Book 3 comes out, even though it may have sold respectably. Anyway, it's an interesting question. If you're mid-list what do you do? If your a fan of a mid-list author, how can you help? I do think if you special order books from an indie there's a greater chance of them adjusting their purchasing practices than if you special order a book an a large chain (my understanding is that books are ordered by chains via computers, where indies would have more human involvement). When I went looking for "So Say We All" and couldn't find it at 2 B&N's I went to, I mentioned this fact to one help desker, and she said that she'd special order extra copies and tag them with a "local author" tag to get them in faster. So maybe one tack is to pimp yourself at the local stores, offering to sign in-store copies and hold in-store readings, and see if influencing the local stores has a wider impact. Or even better, arrange an event where several local authors do a joint signing, bringing that many more people into the store. Their fans might not crossover to each other's works, but a healthy influx of book buyers has to count for something. I think you missed my point. When I mentioned books being ordered by computers at chains, I meant stocked, not special ordered. Any chain will be more than happy to special order a book for you, but it doesn't have much effect on the magic formula used to stock the shelves in that store. I've heard someone who works for a major chain explain this. If ten people go special order "So Say We All" at the local chain it doesn't make enough of an impact on the nationwide numbers to tell the computer program that does the ordering to stock that book at that location. It just doesn't have much of an impact. Now if someone at that store is keeping an eye out they may be able to force the issue, but the chain won't try and stock it just because it's selling well at that location. They don't use a percentage. They use a number sold. So if the chain only orders 100 copies of "So Say We All" total, and sells all of them in a week, they won't re-order, because the book they bought 10,000 of that sold 300 copies that same week. That book is selling better according to their ordering software. THAT is the issue. I'm no expert, but I've heard this from at least four sources now (two authors, two chain employees), so I'm inclined to believe that it's an issue. Maybe you could interview some folks on both sides for C2C? It's interesting that shelving isn't the only concern. I always assumed that it was; you can only store so much in warehouses or the backroom. I love ebooks. I had a thought regarding ebooks and previous books in series. I wondered if it would be feasable to put books on DVDs and sell them right alongside the latest books. Everyone has a DVD player, so you wouldn't need special expensive equipment (*cough* Sony reader *cough*) and I'm sure it wouldn't be difficult to come up with some kind of interface to allow for pleasurable reading. You know, I like Steve Alten's books. They are fast reads and usually fun. But, what a blow-hard! I just felt bad for you guys, your questions were great and he was acting like he was just to big for this very popular show. What a goon! Bravo to you all for putting up with that! FYI Mr. Alten: The book wasn't that good!